CINCINNATI, OH — Big, long, dense speech from Joe Biden on McCain’s foreign policy today, which I’ll parse a little more in depth soon. But first, one face-off between Biden and the facts that, once again, the facts seem to have won. Criticizing McCain for opposing negotiations with Iran, Biden said even the Bush administration now favors such talks — which Obama has long supported. It sounds great for Obama and Biden that the president came around to something so close to their position on talks with Iran; trouble is, the event Biden described never actually happened. In point of fact, the one “meeting” that has taken place was in Geneva, Switzerland, when Under Secretary of State William Burns sat in on a discussion between Iranian representatives and the other “P5 +1″ political directors involved in nuclear talks. The meeting, while a first, was not a negotiation; Burns was there merely as an observer, and had no formal role or talks with the Iranians. So, point by point: Burns was not sent to Tehran; he did not go to Tehran; and there was no such instruction from the President. “After seven years in which our senior diplomat responsible for Iran was not allowed to meet a single Iranian, the Bush administration realized the absurdity of its policy and sent a leading State Department official to deal directly with Tehran.” . . . Here are a lot of pictures supposedly of Stars behaving badly, but many of them simply involve various stars smoking cigarettes or cigars. A few other stars are shown drinking alcohol. Nothing more just smoking or drinking. Some are doing obnoxious activities, but does smoking or drinking really officially constitute "bad behavior" these days? "Firearm holder foils bus robbery"
Traffic in the vicinity of Cross Roads, St Andrew, came to a standstill yesterday morning, following a shooting on a bus loaded with passengers, which left them terrified and two robbers dead. The men were shot by a licensed firearm holder who took them on, along with their four accomplices, at 9 a.m.
Police personnel blocked off the road to collect evidence, forcing motorists to seek alternative routes to get to their destinations. The Constabulary Communication Network (CCN) reported that the six thugs attempted to rob a bus travelling from downtown Kingston. According to CCN, the men boarded the bus at Torrington Bridge and, on reaching the intersection of Studio One Boulevard and Slipe Road, brandished guns and knives and began to demand money and other valuables from the passengers. The licensed firearm holder, who was a passenger in the bus, challenged the men, killing two on the spot - Kashka Clarke and Damian Williams. But Clarke's family members claimed that he was not a criminal. Elaine Scott, the mother of the 23-year-old, said her son was just at the wrong place at the wrong time. "He is a janitor at a hotel. He's not a criminal," Scott said. . . . Thanks very much to Steve in TN for sending me this link. Not content to make its case to the public, the Obama campaign is threatening legal action from its general counsel to make television stations stop running the ads. The Obama campaign cites FactCheck.org and the Washington Post. Yesterday I ran a piece that showed that both of those sources were completely wrong in their claims (see also this). Click on these scanned images of the cease and desist letters to make them larger and readable. She pointedly refused to endorse to Republicans in Alaska who were running for re-election. Quite a response for a Republican to be willing to take. She also wouldn’t say whether she supports the reelection bids of embattled Alaska Republicans Sen. Ted Stevens and Rep. Don Young. “Ted Stevens' trial started a couple days ago. We’ll see where that goes,” she told reporters in what amounted to her first press conference since accepting the Republican vice presidential nomination. The mainstream media have gone over the line and are now straight out propagandists for the Obama campaign. While they have been liberal and blinkered in their worldview for decades, in 2007-08 for the first time, the major media are consciously covering for one candidate for president and consciously knifing the other. This is no longer journalism — it is simply propaganda. (The American left-wing version of the Volkischer Beobachter cannot be far behind.) And as a result, we are less than seven weeks away from possibly electing a president who has not been thoroughly and even half way honestly presented to the country by our watchdogs — the press. . . .
My piece on Fox News yesterday only went through the points in FactCheck that were said to be false or misleading or unsupported. I didn't go through the points where they said were "partially true" or "mostly true." "Expand the Clinton Semi-Auto Weapons Ban to Include Millions More Firearms"
Here is just part of the Illinois Assault Weapons Ban that Obama supported. Note that the federal ban banned a gun if it had two of the following features. This bill banned guns that had just one of these features. "Restore Voting Rights for Five Million Criminals Including Those Who Have been Convicted of Using a Gun to Commit a Violent Crime"
I can't figure out why this is only "mostly true." The claim says "including," not all or even most, and FactCheck's own discussion claims that some people with felony convictions have committed gun crimes. Jeff Bishop has this summary of some other comments. Amber Gunn and Sonya Jones have a new piece on the costs of unions. The problem is that unions use their ability to shutdown a firm to extract higher compensation. The cost of that higher compensation is fewer jobs. Raise the wages, fewer people will be employed. Unions also have a much shorter time horizon than firms. Unions don't own the company and their workers only care about the company as long as they will be working there. Making firms pay more for workers than they are worth reduces the amount that firms are willing to invest. Boeing is in a tight battle with Airbus. We will see how much damage the current strike does to the company. In these economically precarious times, it is difficult to imagine anyone getting a 13 percent raise, but that is exactly what Boeing machinists are demanding—and then some. Tom Wroblewski, president of local District 751 of the International Association of Machinists and Aerospace Workers, asserted that Boeing will pay a price for not offering the union an acceptable contract and averting a strike. “Once you go out on strike, the price goes up,” he said. So much for negotiating. “These members are not going to go out on strike and come back for the same thing that was on the table. The industry rate has been 9 to 13 percent. And we have always been the leaders in the industry,” said Wroblewski. But that’s not all the machinists want. In addition to a pay increase, union members want better pensions and healthcare, and job security. The union wants to dictate to Boeing how many employees it will have and prohibit the company from subcontracting out work that could be done by its members, even if that is not in the best interest of Boeing. . . . The presidential election might be a tight race now, but one of the country’s top pollsters thinks the race will end in an electoral landslide. Despite the books Obama has written, Americans are still asking, “Who are you, where are you from?,” Zogby said. Zogby spoke at the College at Brockport’s Business Briefings breakfast series at the college’s MetroCenter campus on St. Paul Street. He was promoting his new book, The Way We’ll Be: The Zogby Report of the Transformation of the American Dream. Pearson knows Obama well, saying that he was head of the ISRA while Obama was a state senator and Pearson had dealings with him during that time. Johnson's involvement comes at a moment when political association with the failed mortgage giants is particularly toxic. He was already the subject of a McCain ad attacking Obama. . . .
"Al Gore Urges 'Civil Disobedience' Toward Coal Plants"
Al Gore called Wednesday for "civil disobedience" to combat the construction of coal power plants without the ability to store carbon, Reuters reported. The former vice president, whose efforts to raise awareness of global warming have made him the most prominent voice on that issue, made the comment during a session at the fourth annual Clinton Global Initiative in Manhattan. "If you're a young person looking at the future of this planet and looking at what is being done right now, and not done, I believe we have reached the stage where it is time for civil disobedience to prevent the construction of new coal plants that do not have carbon capture and sequestration," Gore said, according to Reuters. . . . . Cutting the capital gains tax would be A LOT less costly than the money spent on this bailout. The discussion can be seen here. Guns have become an important issue for Barack Obama’s campaign. Starting around the Pennsylvania primary, Obama and his campaign surrogates began strenuously assuring gun owners that he supports gun ownership, and it appears to be paying off. A poll in August showed that John McCain only led Obama among hunters by only 14 percentage points, just about half the 27-point lead that President Bush held over John Kerry in 2004. If McCain had a similar lead, he would be ahead in most polls, particularly in many battle ground states. This past weekend, Joe Biden campaigned in southwest Virginia calling any notion that Obama wanted to take away people’s guns “malarkey.” Brian Schweitzer, Montana Democratic governor, previously told reporters that Obama "Ain't ever going to take your gun away." Obama regularly makes similar statements -- at least about rifles and shotguns. 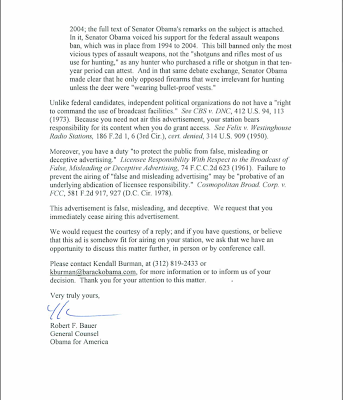 Yet, the NRA, which has given the voting records of both Obama and Biden an “F” rating, has a quite different view, and has started a $15 million ad campaign to warn people about what it regards as Obama’s and Biden’s records. 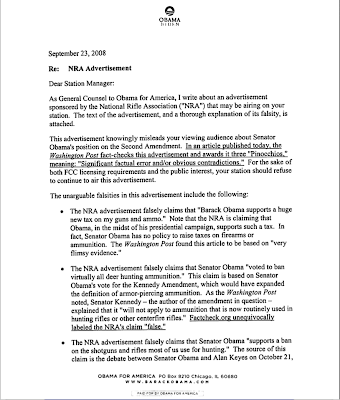 One mailer from the NRA says, "Obama would be the most anti-gun president in American history." Critical news stories have been run on the NRA’s ads in the Washington Post, FactCheck.org, CNN, and many other places. ABC’s Jake Tapper and CBS’s Brian Montopoli posted stories that merely stated what the NRA ads said. But what are the facts? . . .
My analysis piece makes it "above the fold." Read PETA's letter to Ben Cohen and Jerry Greenfield . . . .
Do you think that Obama supporters will get this joke? I may have given away too much in the headline. I wrote Jeff back saying that I think a lot of Obama supporters would read this and think that this letter makes perfect sense. I was planning on voting for Sen. John McCain, but given his vice-presidential pick, I'm voting for Sen. Barack Obama instead. As a nation, we simply can't afford to have an inexperienced, unqualified political neophyte one heartbeat away from the Oval Office. We need an inexperienced, unqualified political neophyte in the Oval Office. Apparently, even the biggest companies can make some serious marketing blunders. Microsoft's "I'm a PC" advertising campaign was created on a Mac and the celebrity spruikers brought in by the software giant are all professed Apple fans, it has been revealed. Hidden information contained in images from the ads published on Microsoft's website show they were created on Macs, a Flickr user revealed in a published screen shot. Microsoft responded by quickly scrubbing the hidden "metadata" information from the images. . . . But even though a third ad featuring Seinfeld was filmed, Microsoft dumped the comic last week in favour of new ads featuring more current celebrities such as actress Eva Longoria, singer Pharrell Williams and even author Deepak Chopra declaring "I'm a PC". But all three are Mac fans, Silicon Valley gossip blog Valleywag revealed. Longoria owns a MacBook and Williams carries an iPhone encased in gold, while Chopra, in a column on nuclear weapons published in the Huffington Post, said it was "good to sell more iPods" as they were "entertaining and harmless". Seinfeld used a Mac in the apartment he lived in on his namesake show and has even appeared in an old Apple "think different" ad. . . . I believe the Rove-Cheney cabal is using Sarah Palin as a stalking horse, an Evita figure, to put a popular, populist face on the coming police state and be the talk show hostess for the end of elections as we know them. If McCain-Palin get in, this will be the last true American election. She will be working for Halliburton, KBR, Rove and Cheney into the foreseeable future -- for a decade perhaps -- a puppet "president" for the same people who have plundered our treasure, are now holding the US economy hostage and who murdered four thousand brave young men and women in a way of choice and lies. Here is the speech that Sarah Palin wanted to give protesting Ahmadinejad's arrival in NYC. Hillary Clinton pulled out when she learned that Palin was also invited and Democrats then pressured those sponsoring the talk to withdraw their invitation to Palin. Here is a list of 460 economists who support John McCain (there are apparently 470, but ten names haven't been added yet). Democrats pressed the administration to agree that the government should automatically take stakes in the companies it acquires, as well as curbs on executives’ pay and bankruptcy reform that would allow judges to modify the terms of mortgage loans. . . .
Newt Gingrich goes after the plan even more. This is the second large scale shooting in less than a year in Finland. A gunman has killed 10 people at a college in the town of Kauhajoki in Finland before shooting himself and later dying in hospital. Media reports named the gunman as Matti Juhani Saari, 22, a trainee chef at the vocational college. The suspect posted a video of himself on the internet last week firing a gun. As a result of this, police interviewed him on Monday but decided they did not have enough evidence to revoke his licence, the interior minister said. . . .
Former Speaker of the House Newt Gingrich said Tuesday that any lawmaker who votes for the Bush administration's $700 billion bailout package, which he called a “dead loser,” will face defeat in November. Gingrich (R-Ga.) said he thinks Treasury Secretary Henry Paulson is trying to scare lawmakers into passing the bailout plan quickly and without thorough study. “I think what Paulson hopes to do is say, ‘If you don’t do exactly what I want you to do, the whole world’s going to collapse on Tuesday’,” Gingrich said. Gingrich said that occurrence would turn the election on its head, with Republicans running ads that feature Obama with President Bush on the same team in pushing for a “nightmare” bailout plan. . . .
Rasmussen Reports indicates that only 28 percent support the Federal Bailout. Still, the most damaging legacy of Fannie Mae's years of unchecked growth may not be evident until the next significant economic slump. Only then, argued Josh Rosner, an analyst at Medley Global Advisors in New York, will the effects of Fannie Mae's relaxed mortgage underwriting standards be felt. A result could be a more pronounced downturn in the real estate market and more stress on the consumer. "The move to push homeownership on people that historically would not have had the finances or credit to qualify could conceivably and ultimately turn Fannie Mae's American dream of homeownership into the American nightmare of homeownership where people are trapped in their homes," Mr. Rosner said. "If incomes don't rise or home values don't keep rising, or if interest rates rose considerably, you could quickly end up with significantly more people underwater with their mortgages and unable to pay." SO far, Fannie Mae's rarefied status as a government-sponsored enterprise has certainly helped holders of its debt stay calm. But life for the company is surely about to change. The biggest difference will be in Fannie Mae's growth. For years, its regulator, the Office of Federal Housing Enterprise Oversight, has allowed the company to expand its business and portfolio to the max. Thanks in large part to Fannie Mae's torrid growth, the market for mortgage securities now surpasses that for Treasury securities. . . .
Biden: "No Coal Plants Here in America"
"When the stock market crashed, Franklin Roosevelt got on the television and didn't just talk about the princes of greed," Biden told Couric. 1) Roosevelt wasn't President in 1929. 2) There wasn't TV in 1929. We might as well include this statement by Biden in this discussion. Jason Lewis reported on his radio show today at the beginning of his program that Biden has already retracted this statement saying that he didn't really know what was in the ad when he made the comment in the above YouTube segment. O'Malley administration officials said Monday that they cannot locate required DNA samples for more than 2,000 convicted felons, some of whom are out on parole. "The attached spreadsheet contains the names of 2,010 offenders who have been identified... as being required to submit a DNA sample but for whom there is no sample in the [Maryland State Police] database," said Philip Pie, deputy director of the state's division of Parole and Probation, in a Sept. 22 e-mail obtained by The Washington Times. . . .
Jason is a very smart guy and as the "official economist" of Radio Free Minnesota it is always fun to be on his show. Listen live here. Podcasts here. 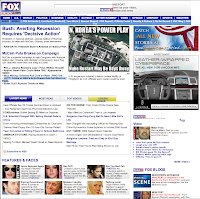 New Op-ed at Fox News: Plausible Deniability? The mortgage crisis has produced a massive case of political amnesia. That happens when one is trying to redirect blame for something that could cost up to $700 billion. Some who now claim that the mortgage crisis is the result of too little regulation saw things more clearly when so much wasn’t at stake. The New York Times editorialized on Saturday that “This crisis is the result of a willful and systematic failure by the government to regulate and monitor the activities of bankers, lenders, hedge funds, insurers and other market players.” If you believe the Times or the Obama campaign, everything but government regulation is to blame for the crisis. Yet, it is not just economists who were predicting these problems. For example, a September 30, 1999, article in the New York Times predicted exactly what has happened: . . . . While there is some extraneous info here, you can see how forceful Biden is here about the statement that Goolsbee claims that he didn't make. VIEIRA: But now we have this mess, Senator. Do you think that AIG should be bailed out by the federal government? BIDEN: No, I don't think they should be bailed out by the federal government. I'll tell you what we should do. We should try to correct the problems that caused this. And what's caused this? The profligate tax cuts to the very, very wealthy that John wants to continue. What's caused this is the failure to have regulation so that, in fact -- John talks about these CEOs getting these big bailout packages. Well, why didn't he support the legislation we have been proposing that says that if you're going to declare bankruptcy, you've got to throw the CEO in the mix as well as everybody else? Why didn't he support the proposals that we have to allow in bankruptcy a federal bankruptcy judge to renegotiate the principal of your mortgage? Why didn't he do something to help the middle-class people who are hurting very badly? Is their government and it's this government's policies that have caused them to get in great trouble. Will racism hurt Obama's chance of election? There are numerous people saying that there are many people who would vote for Obama if it wasn't for his race. Andrew Breitbart sent me this poll that pushes this view. The result: Obama would receive an estimated 6 percentage points more support if there were no racial prejudice. If this claim is true, what does this say about who is racist? Presumably this means that it is racist Democrats or liberals who can't bring themselves to vote for Obama. It can't be conservatives because presumably they wouldn't vote for Obama in any case no matter what Obama's race. Indeed, amusingly enough I just happened to find an earlier version of this AP story on Andrew's website entitled: "Racial views steer some white Dems away from Obama." For whatever it is worth, the later story had a much more innocuous heading: "Poll: Racial misgivings of whites an Obama issue" or "Methods behind AP-Yahoo News poll on racial views." Over 1,000 people have marched through London to a peace rally, calling for an end to knife crime. Their faces shone out from T-shirts worn by their families and friends - the victims of knife and gun crime in recent years. The images of the young men and women captured in happier times were framed by their names and poignantly, the dates of their births and deaths. The peace rally, in terms of noise, was anything but peaceful. Whistles and horns punctuated chants of 'save lives, stop the knives' as the marchers headed for Hyde Park. . . . Thanks to Lonan Dubh for the link. You can read the proposed bailout bill here. Two quotes that caught my attention. CASTLEWOOD, VA – Joe Biden took on an even folksier tone than usual as he campaigned in rural southwest Virginia this afternoon. Though his focus was again on economic issues, he deviated from script to talk about an issue not often discussed by the Democrats: guns. The Delaware senator predicted that Republicans would seek to sway voters by threatening that Obama would take away guns. Biden, claiming to be a gun-owner himself who likes “that little over and under,” called that notion bogus. “Barack Obama ain’t taking my shotguns, so don't buy that malarkey,” he said. “If he tries to fool with my Beretta, he's got a problem.” . . . Meanwhile, the Australian Broadcasting Corp. discusses how important gun ownership is in the Ohio presidential race here. More Union Money Attacking Republicans: Why don't the unions spend this money directly? WASHINGTON — The nation's largest public employee union has funneled more than $5 million to a series of non-profits running ads attacking Republican congressional candidates, federal election records show. Since July, the American Federation of State, County and Municipal Employees (AFSCME) has donated almost $5.5 million to three groups: Campaign Money Watch, Patriot Majority and Patriot Majority Midwest. Those groups have spent more than $2 million on TV ads attacking GOP Sens. Ted Stevens of Alaska and John Sununu of New Hampshire and five GOP lawmakers and House candidates in Florida, Michigan and Ohio. The ads don't mention AFSCME by name. If the AFSCME targets lose on Nov. 4, the results could help expand the Democrats' majorities in Congress. Since January 2007, AFSCME has given more than $1.6 million to Democratic candidates. . . .
Of course, this explains why unions are spending so much money on campaigns.